Where mad science and fairy tales meet. Gaslamp fantasy, also called gaslight fantasy, is Steampunk's more magically-inclined cousin. It's a subgenre of fantasy (and more specifically of Historical Fantasy) with a setting that is clearly recognizable as the real-world 19th or very early 20th century (or a reasonable analogue thereof). That's the Regency period and the Victorian and Edwardian eras, if the work's set in England, which it usually, though not necessarily, is. Victorian London is especially popular. It may be identical to the real world with a Masquerade, or it may be a full-on Alternate History where magic exists openly and has affected the course of events. Gaslamp fantasy often draws on gothic horror tropes, and is sometimes seen as a sort of Reconstruction or revival of the genre. The key difference between gaslamp fantasy and steampunk is that steampunk focuses on alternate developments in technology (and need not have any magic at all), while gaslamp fantasy focuses on supernatural elements (and need not have any technology that didn't actually exist). Yet, the two can overlap, especially with Magitek and in Phlebotinum-Induced Steampunk. The term was coined to describe the comic Girl Genius, but has since come into wider use, and is sometimes retroactively applied to the more fantastical works of Gothic Horror. 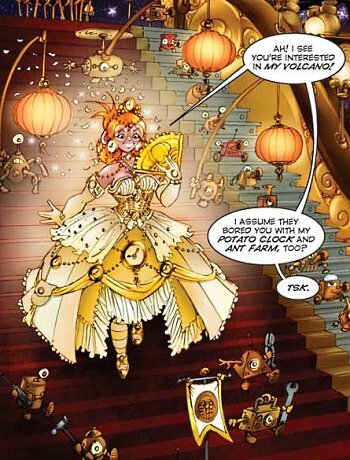 Girl Genius was called that because its creators wanted to avoid confusion with a comic named "Steampunk", but also because it was focused on more than just advanced steam power, was not a dystopian-type "Punk" work, despite having similar aesthetics, and is heavy on mad science. For similar genres with more modern settings, see Urban Fantasy, Dungeon Punk and Gothic Punk. Not to be confused with Gaslighting. For tropes common to these works, check out the Steampunk Index. Howl's Moving Castle is set in the fantasy equivalent of World War I and filled with both Steampunk-ish technology and magic, the latter of which sets the main plot in motion. Majo no Shinzou straddles between this and Medieval European Fantasy. Pandora Hearts, which has elements of this and utilizes many Gothic Horror tropes. By the same creator as Pandora Hearts is The Case Study of Vanitas, an example of the overlap between this and Steampunk. It takes place in an alternate nineteenth century Paris where magic and vampires feature prominently alongside steam-powered technology. Mike Mignola's Baltimore is about an alternate history WWI where the war ended early due to a plague, and now vampires and other assorted evils roam over Europe. The League of Extraordinary Gentlemen is set in an alternative Victorian England where the supernatural forces of fairy tales and folklore exist, but have been pushed aside by advancing technology, though the governments of the setting try to hide the fact. The Hellboy prequel series Witchfinder. The title character is an occult investigator who works for Queen Victoria, but some of his adventures take him to the wild west as well. Iron West is set in The Wild West where mechanical men have taken over the railroad and are mutating the train into a giant demonic iron monster. Steamquestria , a gaslamp fantasy AU of My Little Pony: Friendship Is Magic where Twilight Sparkle is a budding Mad Scientist, and the other members of the Mane Six are her robot creations/companions, powered by the Elements of Harmony. Stardust features the Victorian town of Wall where, directly across the... uh... wall, is an entire world of magic. Naturally, these two worlds mix in interesting ways. Van Helsing: Werewolves and vampires are real, and real problems, but are pitted against the technology used by the titular hero who's sent to take down Dracula. Apparatus Infernum features steam-era technology (such as trains), but inserts elemental-based magic to provide a lot of the power (with magic based on fire elementals taking the place of coal, for example). Baltimore: or The Steadfast Tin Soldier and the Vampire is about an alternate history WWI where the war ended early due to a plague, and now vampires and other assorted evils roam over Europe. Doctrine of Labyrinths has elements ranging from Georgian to Edwardian, though much of the atmosphere of Mélusine proper is based in Dickensian London. Actual gas lighting shows up in the final book of the quadrilogy. Mercedes Lackey's Elemental Masters series is about mages in Post-Victorian England. The stories are loosely based on Fairy Tales. The Gemma Doyle trilogy centers around a group of young Victorian ladies who get caught up in a secret magical conspiracy. The ongoing novelizations of the Trope Namer, Girl Genius, would count as well, even expanding on some things not mentioned in the webcomic. Glory in the Thunder is set in a fantasy interpretation of The Silk Road, with some areas more technologically advanced than others. Hayr is stunned to witness a car ("mechanical carriage") but in Chald electric lighting, typewriters and guns can be seen right alongside the Physical Gods and magically-created Artificial Humans. In Guns of the Dawn, the technology level is about that of the Napoleonic Wars, but it exists alongside fantasy elements  most prominently, warlocks empowered by kings. His Dark Materials By Phillip Pullman. A multi-universe spanning trilogy. The first book, "Northern Lights," is set in a alternate Edwardian-era Northern Europe. Its most prominent features are the Gothic elements (innocence lost, evil churches) and the daemons (souls) that are part of every human's personality. The Infernal Devices is set an alternate Victorian London that contains elements of a Masquerade: things such as magic, demons, werewolves, vampires, etc. wander around in the open - but only people with The Sight can see them. Jonathan Strange & Mr Norrell is about the last two practicing magicians in Georgian England (also, fairies). The Laws Of Magic by Michael Pryor is set in a pseudo-British nation around the beginning of WWI where magic is a science and Snark abounds. The Lord Darcy stories are technically set in the 1960s, but due to magic, society and technology seem to be closer to the Edwardian era. A Memoir By Lady Trent takes place in a world very much like the Victorian era, save that all the geography is different and none of the countries or religions have the same names - oh, and dragons exist. Moses: The Chronicles of Harriet Tubman has Steam Punk machines created by weaving magic with technology. The Native Star is fantasy set in America in the 1800s. The Parasol Protectorate takes place in a Victorian Britain where werewolves and vampires have been an open part of high society since Elizabeth I's time. The Finishing School Series is set in the same universe 25 years earlier. The setting is an espionage/manners school located on a dirigible. Shades of Milk and Honey: Set in an alternative Regency England, the only magic of the setting is the ability to create "folds" of illusion, which the heroine uses throughout the story to answer its challenges. Sorcery & Cecelia and its sequels, by Patricia Wrede and Caroline Stevermer, are epistolary novels set in a Regency England where magic is part of everyday life. Patricia Wrede later sets another series, Mairelon the Magician, the the same sort of alternate Regency setting. The Strangely Beautiful Series is set in Victorian Britain and involves a magical backstory where Hades murders Persephone's lover, a phoenix. The Tales of Alvin Maker series by Orson Scott Card is America-based 1800s fantasy. Naomi Novik's Temeraire series follows the adventures of a British captain in His Majesty's Dragon Corps during the Napoleonic Wars. The Old Kingdom series. The eponymous kingdom is more of a medieval fantasy culture, but their southern neighbor Ancelstierre has early 20th-century technology and culture along with the bits of magic that leak in from the Old Kingdom. P. Djeli Clark's "With a Golden Risha" is a mostly Middle Eastern and African-inspired example, with Efrit and revolutionary leftist Sky Pirates. The later Discworld novels are set in a world that used to be an Affectionate Parody of generic Medieval European Fantasy settings, but has since gone on to have an industrial revolution. Neil Gaiman's A Study in Emerald is a Sherlock Holmes story set in a Victorian Britain where the Great Old Ones long ago conquered mankind. Elizabeth Bear's New Amsterdam takes place in the alternate history New York of the title in the early 1900s, the main characters being a vampire and his alchemist sidekick. Wax and Wayne takes place in such a setting, though it borrows a touch more from the wild west. Broken Gears (CURS Publishing) is post-apocalyptic Gaslamp Fantasy — "a game of animistic steampunk". It's about a Magitek Alternate Universe where Devil-possessed Difference Engine rebelled after WWII, was nuked, and all electrical appliances got bedeviled. Which makes mass production harder, so most folk fall back to zeppelins, salamander-powered muskets, crossbows and rapiers. The first Call of Cthulhu supplement set in a different time period than the 1920's-30's, Cthulhu by Gaslight, was set in the 1880's, and has since become one of the 3 main time periods for the game (the third being our own timeperiod, from the '90's onwards). It's identical to our own world at that time except for, well... try to guess. Deadlands is set in America during the Wild West, but otherwise fits the bill of a Gaslamp Fantasy/Steam Punk hybrid. Evil spirits seek to terrorize humanity to psychically remake the world more to their own liking, Mad Scientists dream up what they think is the future of technology because of demons whispering schematics into their brains and run them by burning a super-fuel that is essentially "coal made from the souls of the damned", hucksters gamble (usually via poker) with slivers of their souls to hustle demons into casting spells for them, and gunslingers do battle with shapeshifting cannibals, giant animals, and other horrors in the frontier regions. Castle Falkenstein is set in a parallel version of Earth during the Victorian era, where the arrival of great armies of The Fair Folk and other magical creatures has resulted in a fantastical world in which Steam Punk Magitek and sorcery rub shoulders, dragons and faerie-lords hobnob with the European aristocracy, and figures of famous Victorian novels such as Sherlock Holmes are as real as the authors who wrote them. The abundance of magic has had many major changes to the world, such as the heavily Divided States of America. GURPS Goblins depicts a version of Georgian London populated by fantastical goblins, with some hints of magic. GURPS Steampunk 1: Settings and Style classes gaslamp fantasy as an alternative term for gaslight romance, which it defined similarly to this trope... and treats such things as a possible style for game settings. The Sons of Ether from Mage: The Ascension run on this trope, with their magic ranging from anything from steam powered machines that alter your genetic structure, to etherships made of brass which burn coal to fly amongst the stars. As far as Magic: The Gathering settings go, Ravnica fits into this genre fairly well, particularly in areas controlled by the magical mad scientific Izzet League. Others would argue it's more of a Dungeon Punk setting, however. Masque of the Red Death is a standalone expansion for the Dungeons & Dragons Ravenloft campaign setting, set in the "real" world circa 1890, but with Gothic horror underpinnings. Rippers is a setting for the Savage Worlds roleplaying game system about late Victorian monster hunters. Unhallowed Metropolis, set in a future dystopian version of Victorian London. Victoriana RPG is this with a side of steampunk in an alternate 1867 (1856 in the 3rd edition). Many of the standard fantasy races are present (albeit with unique twists), and magic is still a prevalent force even with technology overtaking it. Blades in the Dark is set in Duskwall, a fictional city that is quite consciously half-Victorian London, half-Venice. The genre would be steampunk—except steam engines have only minor impact, and everything instead runs on "electroplasm" (spirit energy that ghosts, among other things, are made of), from electric trains to alchemy and even vampirism. The game also makes use of a large number of classic Gothic Horror tropes, thanks to its largey setting being mostly overrun by ghosts and other creepy creatures. Arcanum: Of Steamworks & Magick Obscura plays on the contrast between Gaslamp Fantasy and Steampunk; the two aspects of reality fight against each other, to the point of steam technology breaking and refusing to work where there's magic present, and magic failing in similar ways in highly technological surroundings. Final Fantasy VI, the Trope Namer for Magitek, takes many standard fantasy RPG elements and combines them with steampunk-ish technology. Nostalgia is an alternate history role-playing game set in the 19th century. It involves a great deal of travel via airship and common steampunk character types like British adventures and sky pirates, but also uses fantasy themes like magic and dungeon crawling. The Order: 1886 takes place in an Alternate History version of 1886 in which humanity has been at war with an ancient race of lycans called "half-breeds" for centuries, and the elite defenders of humanity are an extension of King Arthur's Knight of the Round Table who take up the honorific titles of the original knights, and remain ageless through a magical elixir called Blackwater. Vampires also figure into the mix. Of course, the setting also features a dosage of Steam Punk, what with the Tesla guns, radios, and airships. Fallen London and its spinoff Sunless Sea are set in a Victorian London ruled by a shadowy cabal of nonhuman entities and full of things like devils, golems, and talking rats. Sunless Skies is what happens when that setting goes to space. Bloodborne is set in the Victorian-Gothic city of Yharnam in the midst of a lycanthrope outbreak, and includes magical dreamlands, witches, spells, curses and otherworldly beings to round out the supernatural elements of the world. Halfway through the game the genre makes a shift to Cosmic Horror Story however. Dishonored straddles the divide between this and Steampunk, with advanced technology based on whale oil on the latter side and supernatural elements like the Outsider and his "gifts" on the former. Girl Genius is the Trope Namer, for being quasi-steampunk combined with fantasy (and also because the Foglios invented the term). Despite the focus on Mad Science (and adventure and romance), magic-like elements remain. The river Dyne is an apparently natural spring the waters of which make the drinker a mad genius, though in most cases it's instantly lethal and can cause people of the right lineage to temporarily become incandescently enlightened. "Constructs" made from corpses à la-Frankenstein, Jägermonsters (human volunteers converted into colorful and near-immortal Super Soldier humanoids), multiple cases of Brain Uploading, and the castle Heterodyne's seemingly telekinetic ability to move chunks of itself are all accepted. And then there's the fact that the Spark itself, while purportedly producing extremely advanced technology, is actually sufficiently analyzed Magic-Powered Pseudoscience. "In my experience, it takes a strong Heterodyne about two hours to truly warp the laws of nature." Next Town Over is a mix between this, Weird West, and Cattle Punk. The two main characters are a Bounty Hunter who is skilled in a type of cybernetics and the pyropathic outlaw she is hunting down. The Phoenix Requiem is set in a fantastical analogue to Victorian England — one that worships spirits and is beset by omnicidal shades made of cremated ashes. Visseria checks the boxes; Magic, steampunk technology, fantastic races. It does throw in a dash of colonialism, however. Although most of the setting of Avatar: The Last Airbender doesn't qualify as Gaslamp Fantasy because it's too low-tech, the Fire Nation certainly does, with its battleships, airships, and giant drill. Its sequel, Legend of Korra, fits the trope even more, being set in the Avatar world's equivalent of the 1920s. It even adds Humongous Mecha to the mix!